Zilberman Gallery–Berlin is proud to announce Simon Wachsmuth’s first solo exhibition in Berlin, Some Descriptive Acts. The exhibition will take place in Zilberman Gallery’s space on Goethestrasse between March 4 and April 20, 2017. The title of the exhibition is inspired by Wittgenstein’s notion of “Beschreibung” (description), focusing on the idea that human behavior is narrated, and thus, a story cannot be approached directly. Reflecting on Wachsmuth’s long-term interest in observation and description, the exhibition brings together four different works, questioning the acts related to the materialization of memory and the cultural (re)constructions of history. Various materials such as ceramics, porcelain, stone and textile are the constituents of the visual narrative that is outspread in the exhibition. The video titled “Qing” is the main piece of the exhibition. It shows a dancer interacting with traditional Chinese silk-robes and porcelains. Taking its roots from a personal story, this piece focuses on the idea of “migration of gestures” through the situation of the immigrants who cannot take anything with them except the physical knowledge that is part of their cultural heritage. 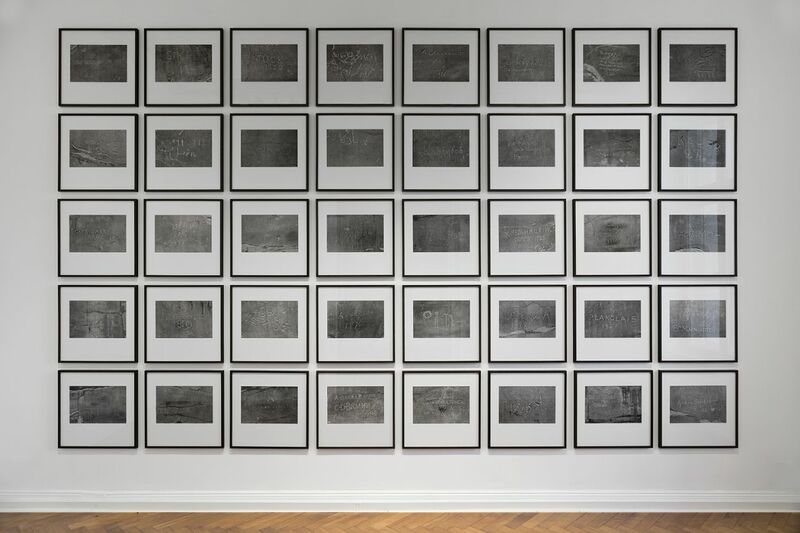 Accompanied by an arrangement of archival materials, “Qing” experiments with narrative formats and modes of meaning production, thus suggesting an interpretation of the continued existence of antique forms and signs into the present. In Wachsmuth’s photograpic series “Signatures”, the audience is confronted with names of travelers and visitors inscribed in the stone walls of the antique Gate of All Nations in Persepolis, Iran. Highlighting the idea that archeology has always been part of political interests, the work focuses on this proprietorial act as a gesture aimed at claiming legitimacy for the right of exploitation. Another group of photos stands in a close dialogue with this series, a triptych showing Christian icons from Cappadocia–whose faces have been erased. This work shows another violent mode of rededication from the course of history: the iconoclasm. In both cases, the underlying material holds the memory of what was once written onto it, keeping the historical account as a dynamic process. Similarly, Wachsmuth’s series “Master of the Nets – The Kochi Tiles” is concerned with the movement of forms through time and space. It depicts Chinese tiles from the seventeenth century that he encountered in a synagogue in Kochi (India). This observation adds up to the narrative of the exhibition by adressing the notions of repetition and singularity in relation to shared and differentiated characteristics of cultural heritages. The works in the exhibition Some Descriptive Acts come together to question historiography, archeology and their inescapable subjective characteristics. Simon Wachsmuth (Hamburg, 1964) lives and works in Berlin and Vienna. He studied painting and visual media design at the University of Applied Arts, Vienna. He participated in solo and group exhibitions nationally and internationally, at prestigious institutions including Steirischer Herbst/Kunsthaus Graz (2016), Suzhou Museum of Art (China, 2016), Neues Museum Nürnberg (2016), 21er Haus in Vienna (2015), Busan Biennale (South Korea, 2012), the Museu Reina Sofia in Madrid (2010), Istanbul Biennial (2009) and documenta12 (Kassel, 2007). He was awarded the Otto Mauer Prize (2003), the distinction of the Prix Ars Electronica (1989) and most recently, the Prize of the Wemhöner Stiftung of the Marta-Museum in Herford. Wachsmuth was a guest-professor at the University of Applied Arts Vienna, the Academy of Fine Arts in Prague, and currently at the Bauhaus-Universität in Weimar. Some Descriptive Acts is accompanied by a catalogue, with a preface by Lotte Laub and texts by Naz Cuguoglu, Karin Gludovatz and Goksu Kunak. A conversation with Simon Wachsmuth will be held at the gallery. Date to be announced.